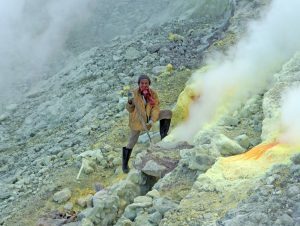 Where does all that sulphur come from? This blog is about the remnants of the hellish industry of sulphur mining, which I recently witnessed first‑hand on the island of Java. You may be familiar with the important role than sulphur and sulphur dioxide (SO2) play in preserving the health of, respectively, vines and wines. Sulphur in powder form has long been dusted onto vines to discourage powdery mildew, a fungal disease. More precisely, it attacks a vine fungus called Uncinula Necator (or Erysiphe Necator). “I thought the fungus was called Oidium”, I hear you say. Almost right: in fact the form of this fungus during its asexual reproductive stage (its anamorph) has the name Oidium tuckeri, one member of the Oidium genus. Once the grapes are harvested then SO2 is employed. Its main functions are to inhibit or kill unwanted yeasts and bacteria and to protect wine from oxidation. In conventional winemaking, SO2 is often added during each stage of the process: to keep harvested fruit from spoilage, at crushing, during fermentation and at bottling. It may also be used to sterilise barrels for re-use, either as an ingredient in the rinse or traditionally by burning a few grams of sulphur inside the barrel. In contrast, in natural winemaking, SO2 is added sparingly, maybe just at bottling or not at all, though there is always some natural SO2. There is an associated literature as to whether residual sulphites might affect the taste (yes, probably for the better, but discussable), cause headaches (no) or trigger an allergic reaction (very rarely, yes). By the way, SO2 is not a sulphite, though the terms are often used interchangeably. The usual additives are the sulphites sodium metabisulphate (Na2S2O5) and potassium metabisulphate (K2S2O5), which release SO2 when dissolved in water but leave other residual compounds too. SO2 itself evaporates quickly from the glass. So where does all this sulphur come from? 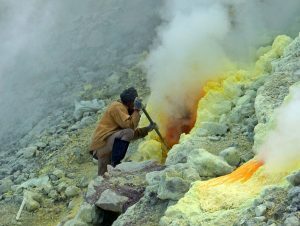 Today, most of it is extracted as a by-product in oil refineries, but elemental sulphur is still mined from volcanoes. The ancient ‘Sicilian process’ consisted of stacking chunks of ore in brick kilns and firing them so that the free sulphur melted and ran off. When surface deposits became exhausted, sulphur was mined instead, under horrific conditions. Each miner would have a carusu, a young slave boy who carried the ore out of the mine. Some were recruited at just five years old. They worked 8-10 hours a day and sometimes lived in the mine too. If they continued working as adults, they grew up stunted and deformed from the heavy burdens. Sicilian mining is no longer, nor its equivalent in Chile or New Zealand, but surface mining continues on Java, Indonesia. 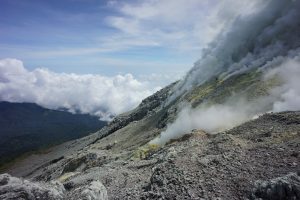 There are two main operations, both in East Java: Mount Ijen and Mount Welirang. Both are active volcanoes and both are trekking peaks. I recently climbed Welirang, named for sulphur, which is belerang in Indonesian. One of the paths to the summit passes a viewpoint of the slope where the miners work and from where these pictures were taken. Thankfully, there are no children involved, and the number of miners is dwindling, from hundreds down to dozens; the new generation prefers other occupations. My porter waved to one of the miners, his friend, and some do both jobs according to the season. 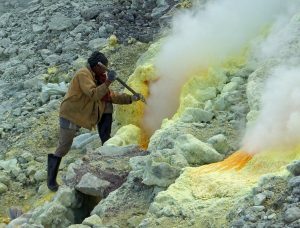 This has to be one of the world’s worst jobs: balancing on a treacherous 45° slope while digging blood-red, burning-hot sulphur out of a stinking fumarole, always with the risk of sudden asphyxiation from erupting gas; then carrying their payload of 75kg or more off the hill to the weighting station, from where it is taken down by jeep. The pay is poor, too, less than £10 per day. In case you are wondering, these porters bite on a wet scarf in an attempt to absorb some of the fumes. The sulphur’s main uses are for bleaching sugar, making matches and fertiliser, and vulcanising rubber. Thankfully, it doesn’t end up at any of Indonesia’s wineries (which will be the subject of my next blog); I don’t want that association when drinking the rather good local wine over dinner.